A partnership working to promote solar-powered electric vessels in Tunisia and in the Middle East and North Africa was awarded the $1 million 2016 Energy Grant from the United Nations Department of Economic and Social Affair (UN-DESA), it was announced today. The project “Solar Fuelled Electric Maritime Mobility” by SINTEF, an independent non-profit research institute based in Norway, seeks to demonstrate the feasibility and the social, economic and environmental benefits of solar-fuelled electric boat transport in Tunisia and the wider region. It is implementing this demonstration project with the National Agency for Energy Conservation of Tunisia. “We are extremely honoured to receive this grant from the United Nations, rewarding SINTEF for leadership and innovative practises in energy for sustainable development. Our vision is ‘Technology for a better society’, and it is essential to develop new and innovative energy solutions to succeed”, said Alexandra Bech Gjorv, CEO of SINTEF, at the award ceremony. She added that the project in Tunisia combines many of SINTEF’s research areas, like marine technology, solar energy, power systems and future transport systems. “The transport sector is responsible for nearly a quarter of energy-related greenhouse gas emissions. It also has significant public health impacts,” said Secretary-General Ban Ki-moon at the award ceremony. “The answer is not less transport – it is sustainable transport. We need transport systems that are environmentally friendly, efficient, affordable, and accessible,” he said. “We firmly believe that energy belongs to all of us, today, and tomorrow. And each and every one of us has the duty to use energy sparingly, wisely, and responsibly. 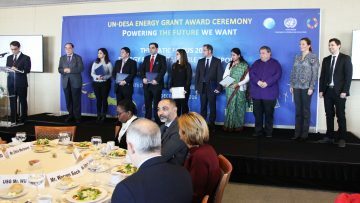 By partnering with UN DESA in making this grant possible, the China Energy Fund Committee is sending out a most sincere message loud and clear, of collaboration and partnership to all our friends from near and afar, in working together to find solutions for energy security by achieving energy sustainability for the entire humanity,” said Dr. Patrick Ho, Secretary-General of the China Energy Fund Committee.